Steinberg are very proud to announce the availability of Nuendo 5, the newest incarnation of Steinberg’s solution for demanding professionals working in audio, live and post production. Nuendo 5 allows for an ADR-like workflow (including EDL support), comes with excellent surround features, and also provides a unique automatable bus-destination routing system that lets you create different mix versions in one go. A completely new video engine guarantees stable video playback in SD and HD, and the ability to work with multi-mono files means industry openness. An array of additional enhancements and 64-bit technologies boost performance and enables Nuendo 5 to handle even the largest projects. 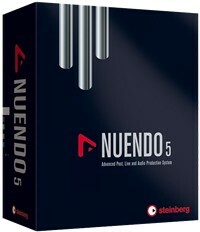 Read more about Nuendo 5 for Post Production, Live Recording, and Studio Mixing.